From the very beginning of this shoe project I had a clear picture of how I wanted them to turn out, and i'm so happy that they're pretty much identical to what I had imagined! 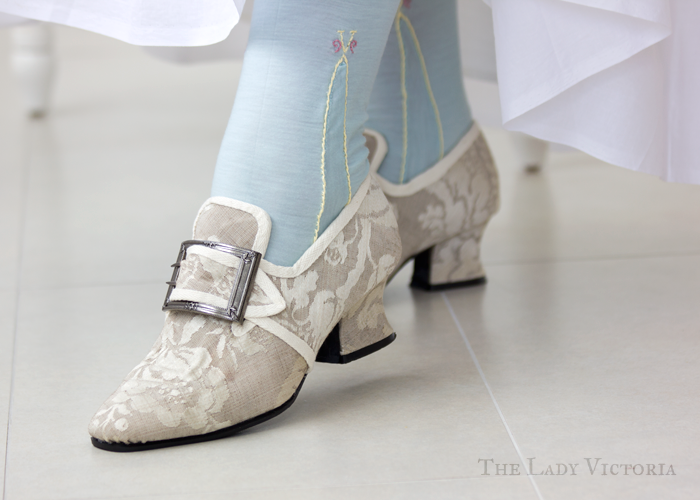 I'm planning for my first robe Robe L'anglaise to be creamy and coppery colours, and I wanted a nice neutral pair of shoes to match. 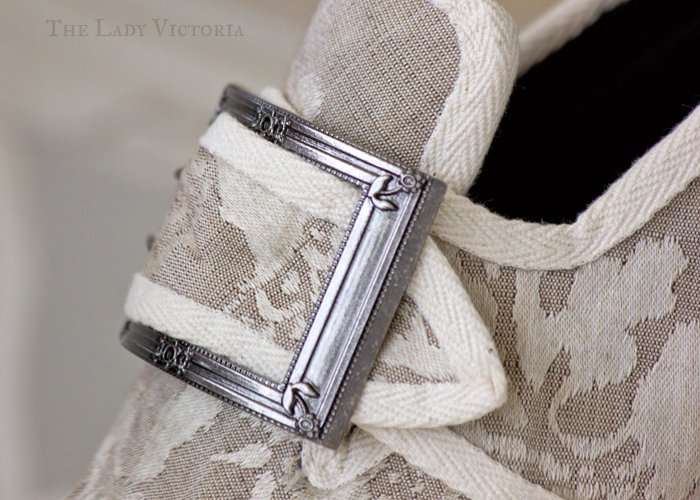 The buckle needed to work with lots of different shoes though, so I chose a nice silver pair from American Duchess. I was happy to see that the finish on the buckles gives them a warm look, instead of a cool silver tone. I was terrified to try them on for the first time. 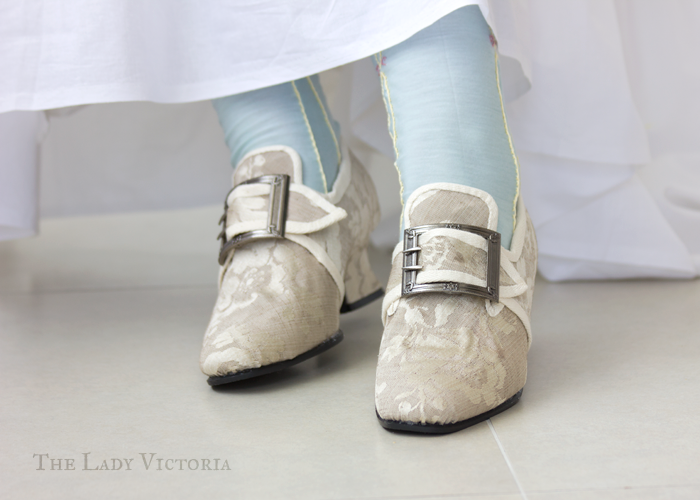 The original shoes had been sightly too big for me, but with the added binding and general reconstruction, the finished shoes were a snug fit. Luckily nothing came undone or broke as I was wearing them, but i'd be hesitant to go walking around outside. I didn't really cover it in my construction posts, but gluing the sole on was by far the worst part. It required lots and lots of glue, getting very messy and holding it down for a long time. It feels sturdy enough, but i'm worried lots of walking will make it peel off. 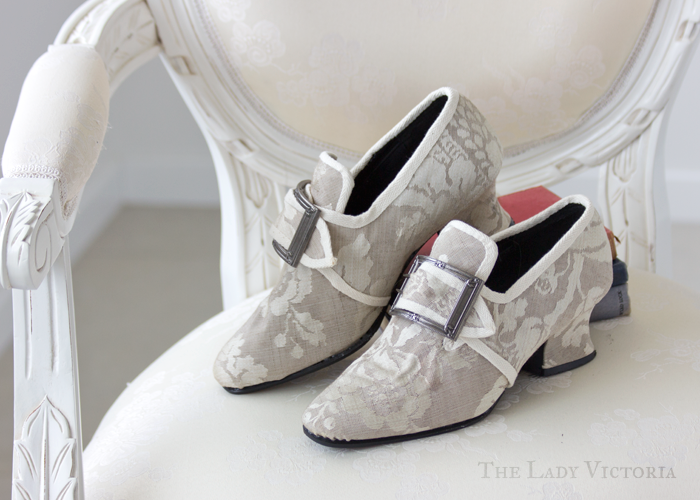 Despite the lack of a true Louis heel, they still look very mid 18th century. The rest of my wardrobe is currently aimed at the 1780's, but not every lady would have been dressed head to toe in the very latest fashions. I'm glad I chose the plainest of American Duchess's buckles. 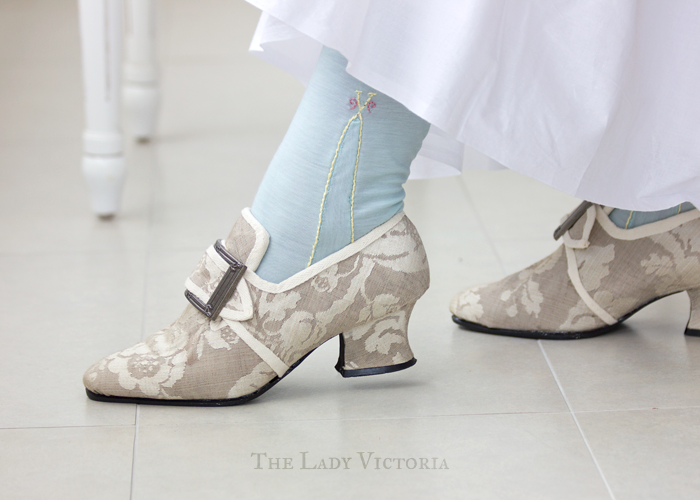 I think it looks perfect with the simple colours and lines of the shoe, and can be re-used on other shoes easily. I still like the bejeweled buckles, but i'd want to make a specific shoe to go with them. I'm happy I left the trim off. 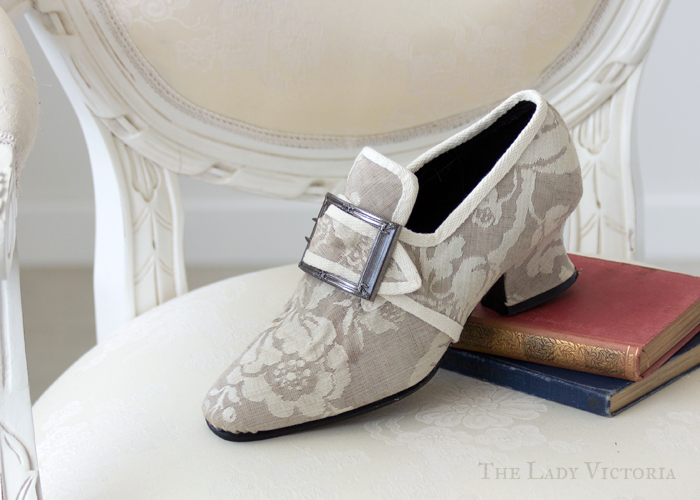 The contrasting cream binding really brings out the pattern in the jacquard and looks very period. 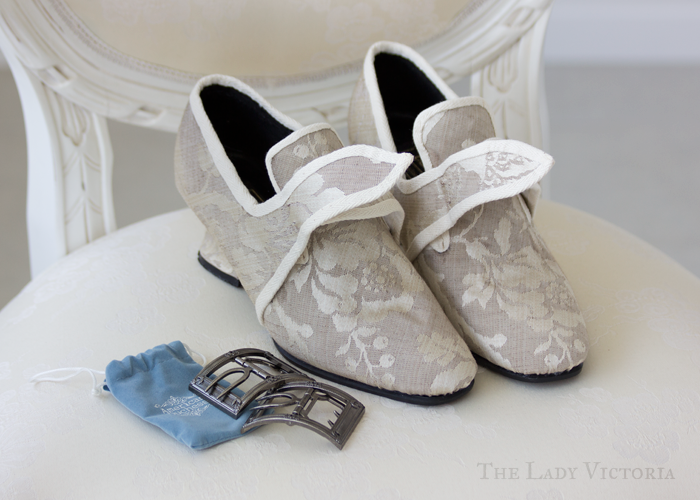 As much as i'd love an over the top shoe with piles of ruffles and trim, it will have to wait. This is the first item for my wardrobe i've made that isn't blue or white, surprisingly. 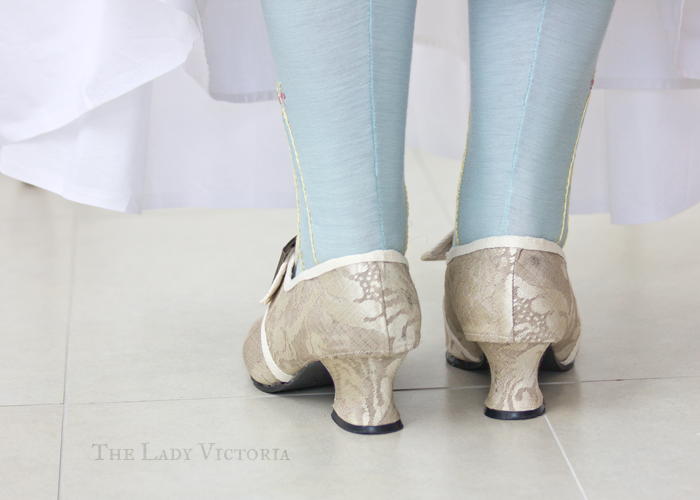 I personally think the shoes clash with the light turquoise stockings, I really need a couple of white pairs. Putting the buckles on was quite a challenge, as the straps were pretty thick. The weave of the jacquard was loose enough, but combined with interfacing and a cotton duck lining it was just too much. The buckle on my left shoe sits perfectly, but the one on the right is wonky and not centered. If I went back and re-holed the straps I might be able to get it sitting properly. The fact that both shoes have left facing straps doesn't help either! For my next pair i'll definitely pay closer attention when making the straps, and maybe skip the interfacing. They look fantastic! Job well done!